Primarily a pest in California, velvety tree ants have been found infesting homes in some isolated areas of the north Willamette Valley. These small ants are easily identified by their velvety black abdomen, red thorax, and brownish-black head. Their size ranges from 1/16 to 1/4 inch long. Typically, they nest in tree stumps and cavities (favoring hardwoods such as oak and poplar) or under stones on the ground. They tend to be found more commonly in areas near streams or standing water. When infesting wood, they can mine wood and produce frass much like carpenter ants, only of a finer texture. They typically eat honeydew produced from aphids, but will go after other food sources including other insects and dead birds. When infesting homes, they tend to travel through the home rather than nest in it. However, when they do nest in a structure evidence of infestation is similar to that produced by carpenter ants (fine to medium textured sawdust-like frass, oftentimes with other organic material mixed in). They can invade a home in large numbers in a short period of time. 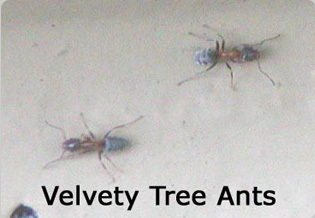 Actual damage requiring repairs can occur with velvety tree ants if left unchecked in a structure. Their bite is quite painful, simultaneously spraying formic acid into the bite that can cause discomfort for some time. Corrective measures: Serious infestations in structures can require treatment measures similar to that performed for carpenter ants. Leupitz Pest Control can address your problem by examining the site and making appropriate recommendations.